With a month-long campaign ending on September 5, traffic police spread awareness for helmetless women riders. 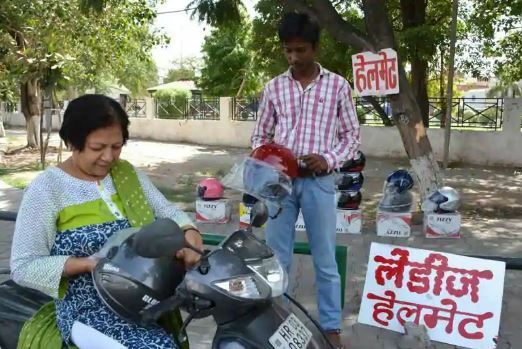 As a part of this awareness campaign on Wednesday, traffic police organized a 30-km-long helmetto educate the people of Chandigarh. Around 200 women were seen taking off with this rally flagged from Post Graduate Government College, Sector 11. The police would start challaning women who will not be wearing helmets while riding two-wheelers from September 5. All the elegant ladies of Chandigarh you have a week’s time for purchasing the safety gear. The fine for driving without helmets is about Rs 300 and Rs 600. The main objective is to spread public awareness amongst road users to wear helmets while riding two-wheelers. Last year, police had challaned 33,727 two-wheeler riders for driving without helmets.Thus, a new law to make Chandigarh less accident prone has been initiated and supported by the people of Chandigarh.